Buddha Statue. 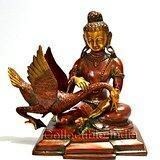 Gautama Shayamuni Siddhartha Buddha and The Swan Statue Kindness Personified. For Animal & Birds Lovers & those who understand importance of them !! !! SAVE ANIMAL & BIRDS !! It gives me immense pleasure to bring this interesting story teller & inspiring Buddha statue saving life of a Swan. Size : 9 inches Height X 9 inches Wide Weight : 3.9 Kg, Heavy Solid Statue. The Buddha, variously termed Shakyamuni or Thathagat founded Buddhism in the 6th century B.C. He was born as Siddhartha to Shuddhodana, the ruler of the Shakyan republic, and his wife Maya It was prophesized at his birth that he would leave the material world and become an ascetic. This artifact narrates a tale from the early years of his life. Siddhartha was once playing with his cousin who shot down a swan. With the arrow pierced in its body, it fluttered down. Siddhartha ran towards it, pulled the arrow of its body and tended to its wounds. Here a small arrow is visible close to Siddhartha feet and he is caressing the injured bird. To understand and appreciate this wonderful piece, it is imperative to know what followed. His cousin claimed the bird as he had shot it down and Siddhartha claimed it for he had saved it. The decision was left to the bird which staggered towards Siddhartha, proving that the one who saves is greater than the one who hurts. The way, the gentle expression of his face has been captured in solid bronze is commendable. The hands are long and thin with tapering fingers. He is dressed as a prince with ornaments adorning his ears, neck and hands. His curly hair is knotted at the top. The bird is an unattached piece with the fluttering movement of the wings freezed. Its beak remains open as if shrieking with pain. The webbed feet, the feathered wings and the delicate neck of the swan has been intricately worked upon. A wonder piece that manages to bring out kindness and all that is good in a human being just by being there.